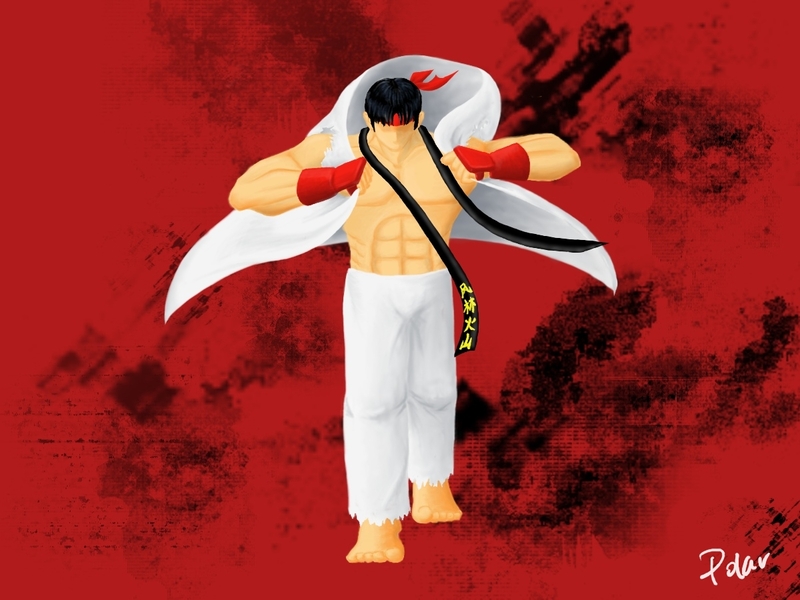 This is a fan art digital painting of Ryu, a character from Street Fighter. Ryu is my favourite character from Street Fighter even though I’m lousy at the game. I did everything using Gimp and my Wacom graphire 3 tablet, from sketching to the colouring. I think I’m getting more used to using a tablet even though I still find it easier to draw on paper. When I sketched out Ryu, I decided not to give him any facial features such as eyes, nose and mouth because these are the hardest to draw and I don’t want to spend too much time on them. I’m still not very used to drawing on a tablet and I don’t know whether I’m proficient enough to do such detailed work. So in the end I put his face in shadows. I wanted to give Ryu a more interesting pose than just standing there. Since he is from a fighting game, the logical conclusion is to put him in a fighting pose but it felt kind of boring to me. I wanted something that was not commonly used but at the same time, not too hard to draw and had a bit of movement. After playing with a few ideas, I decided to do a pose of Ryu getting ready for a fight. I used his clothes to add a feeling of movement to the picture. Since there were so many versions of Ryu, I used his clothes to identify him. I drew him mostly from memory, only checking to make sure that I had his clothing correct. I’m a drawer, not a painter and I don’t really like colouring but in this piece, I tried to do everything in colour, shades and tones, even forgoing the black outline that I am used to. I think the result was not bad. It was only after I finished colouring Ryu, then I chose the background colour. It took me a while to decide. I can’t pick white as Ryu is dressed in white; black is too black and grey is dull. In the end I settled on dark red and I used some grunge brushes to make the background more interesting. I started this painting in January and I only just completed it. Even though the painting was only just finished, I could already see some mistakes.